Les Survivants are an example of new, anti-abortion activism in Europe targeting young people with digital tools and disinformation campaigns. 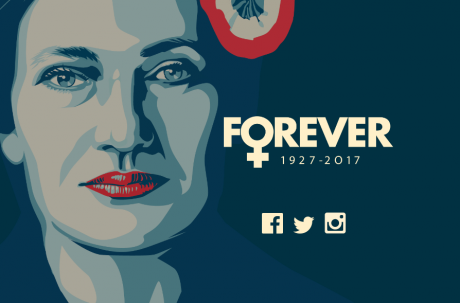 When Simone Veil, the feminist revered for legalising abortion in France, died in June 2017, a striking portrait of her, in the style of Shepard Fairy’s iconic Barack Obama “Hope” poster, appeared on a new website bearing her name. The image, apparently the work of a graphic designer called “Juliette”, was also sent to a number of journalists and offered for their license-free use. Shared more than 20,0000 times on Facebook, it was an online, social phenomenon. Veil, a survivor of Auschwitz-Birkenau concentration camp, served as Minister for Health in France as well as President of the European Parliament and was only the fifth woman in history to be buried in the Patheon after an emotional digital campaign demanded that she be laid to rest there. Emile Duport, CEO of a digital agency called NewSoul is Les Survivants’ leader. I spoke to him last summer about their "digital and cultural guerilla tactics". He explained how they were reframing the conversation to reach new, young audiences. “Repositioning Les Survivants as victims of abortions”, he said, means “you have a victim facing another victim and it re-balances the debate”. They “are at the cutting edge of technology, and currently the pro-choice movements are struggling a bit to develop that type of support”, said Eloïse Malcourant, at Belgium’s Federation of Family Planning Centres. Duport was previously the communications director of “La Manif Pour Tous”, an anti-LGBT rights group that also targets young recruits and was described by one researcher as “the most successful right wing phenomenon in decades”. But Duport dismissed efforts “to categorise us as right-wing, left-wing, Catholics, etc”, telling me: “This is a humanitarian topic. It is like ecology for us. We try to give [it] a higher meaning". During France’s 2017 presidential elections, Les Survivants deployed more traditional guerrilla campaign tactics including illegal postering of the Paris metro. Advertisement posters were replaced with ones featuring faces of the candidates with 'soft', anti-abortion messaging. Their messages included calls to politicians to “not close the borders of our lives”, mirroring the language of progressive campaigns. “France must be a place for all, so let us all have the chance to live”, their ads implored. One article on the site shared a song from the popular Toulouse rappers BigFlo & Oli, which features the supposed voice of a fetus, due to be aborted. “Why didn’t you want me?”, it asks. “Let me call you “Mummy”... I could have been a big artist, a Nobel prize [winner] or a gangster”. According to Séhier, at Family Planning France, Duport would later pilot the French communication strategy of a Europe-wide anti-abortion campaign called “One of Us”. One of this network's French members is the Foundation Jérôme Lejeune (which is in turn tightly linked to the Catholic Church). Duport told me he consults with foreign groups that “share his ideas” but insisted they provide no financial support for Les Survivants. He said the group is “more like a junior company”, supported by “some private donations”. “We are not an NGO. We do not legally exist because it’s too complicated”, he added. In France, NGOs must publicly disclose annual financial accounts.